This corporal's regiment can be determined by the regimental Arm Badge he is wearing above his rank stripes, an oval shield displaying the Regimental Prussian Eagle. This kind of arm badge is often called "Sergeant Arm Badge", as it was usually worn by NCOs from the rank of sergeant on - two notable exceptions being the 14th and 19th Hussars. 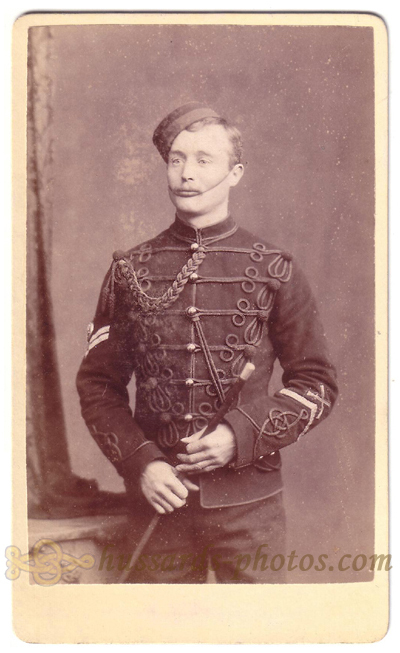 Our man is also wearing a Long Service and Good Conduct stripe (shifted from the right to the left sleeve c. 1880) and a badge indicating his Drill Instructor specialty.